If you have a web server set up in your ESP32 device, you might want to add resources like images or java-scripts, that are referenced from your web documents. 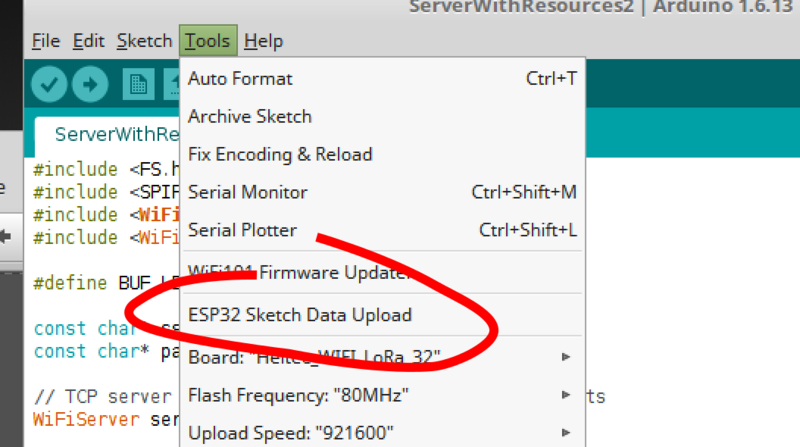 I can imagine, that a quite few people does not know, that ESP32 (and ESP8266 as well) has a built in file storage area in the flash memory. For a web server context, the idea is that you can upload your binary content into this file area, where your web server can forward these files to the client requests. You can access files in this area with the SPIFFS library. This is an example as matters stands in February 2018. // First line of HTTP request looks like "GET /path HTTP/1.1"
s = ""; // Request already served no more lines to send. As you can see in the code we handle unidentified URLs as resources can be found on the file system. The idea is that you have “data” folder inside your current sketch folder, and you can upload all files in this folder with the tool. I have personally faced with some issues around this tool, as some files was not uploaded correctly to the flash with this tool.